Pulmonary complications are common in cardiac surgical patients. Limited respiratory reserves along with the pain associated with sternotomy add to the morbidity. Patients undergoing cardiac surgery who have had a pneumonectomy done before can be even more challenging to manage perioperatively due to a single-functioning lung. We present a case of a postpneumonectomy patient who underwent off-pump coronary artery bypass grafting. Perioperative optimization of lung function tests was stressed upon including the chest physiotherapy and early mobilization. Preoperative thoracic epidural catheter was inserted for postoperative pain and other proven benefits of thoracic epidural in coronary artery disease patients. We could conclude from our experience that proper optimization of lung function tests and meticulous pain management along with fast-tracking are keys to the management of such patients. Pulmonary dysfunction is, perhaps, one of the most common and most challenging Complication after cardiac surgery. It is the leading cause of postoperative morbidity and mortality after cardiac surgery. Assessment of pulmonary functions is of utmost importance before any cardiac surgery. Midline sternotomy leads to postoperative deterioration of lung function tests. Pain and prolonged supine position without ambulation are also culprit factors, leading to postoperative pulmonary complications. Patients with single lung pose a serious challenge – mediastinal displacement to the opposite side, changed anatomy of the heart, and limited reserves of the existing lung pose both surgical and anesthetic challenges. We present a case of single-lung patient undergoing off-pump coronary artery bypass grafting (OPCAB). A 66-year-old male patient, who was hypertensive and non-diabetic, presented to the outpatient department with complaints of dyspnea on exertion (New York Heart Association Grade III) and unstable angina. He had right-side pneumonectomy done 12 years back for small-cell carcinoma. He was chronic alcoholic and had quit smoking 12 years ago. The patient was currently on methylprednisolone. Pulmonary function tests showed moderate obstructive pattern with reversibility (forced vital capacity [FVC] – 1.60%, 45% of predicted and forced expiratory volume 1 (FEV1) – 1.11%, 39% of predicted, and FEV1/FVC 0.69). Room air arterial blood gas analysis showed pO2 of 68 mmHg and a pCo2 of 43 mmHg. 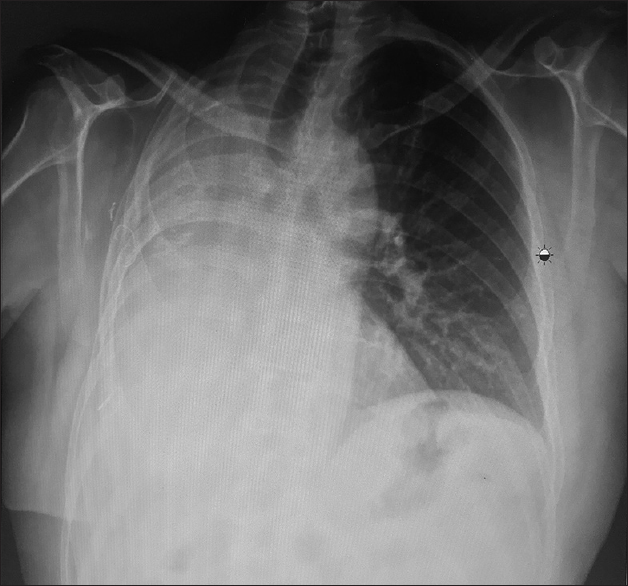 Chest X-ray showed post right-sided pneumonectomy changes [Figure 1]. Computed tomography showed right-sided deviation of the mediastinum with overinflated left lung [Figure 2]. Incentive spirometry was started a week in advance with addition of bronchodilators, and deep breathing exercises were initiated. The patient was put on prophylactic antibiotic cefuroxime, as total leukocyte counts were high. Preoperative workup was done as per the protocols. It was decided to insert a thoracic epidural catheter pre-induction on the day of surgery for postoperative pain control and the proven benefits of thoracic epidural anesthesia on lung functions. On the day of surgery, after taking an informed consent, a thoracic catheter was inserted in the T1–T2 interspace under all aseptic precautions. The patient was induced with thiopentone, midazolam, fentanyl, and vecuronium. Anesthesia was maintained with sevoflurane and incremental doses of vecuronium and fentanyl. The patient was put on volume control mode with a tidal volume of 450 cc, a respiratory rate of 16/min, and a Fio2 of 0.55. Minimal opioids were used thereafter during the surgery. After a midline sternotomy, an OPCAB was performed, and venous grafts were placed (reversed saphenous vein graft to left anterior descending and ramus intermedius). The patient tolerated the procedure well with normal arterial blood gas values throughout the surgery. The patient was shifted to the Intensive Care Unit (ICU) with minimal inotropes. ICU course was uneventful. 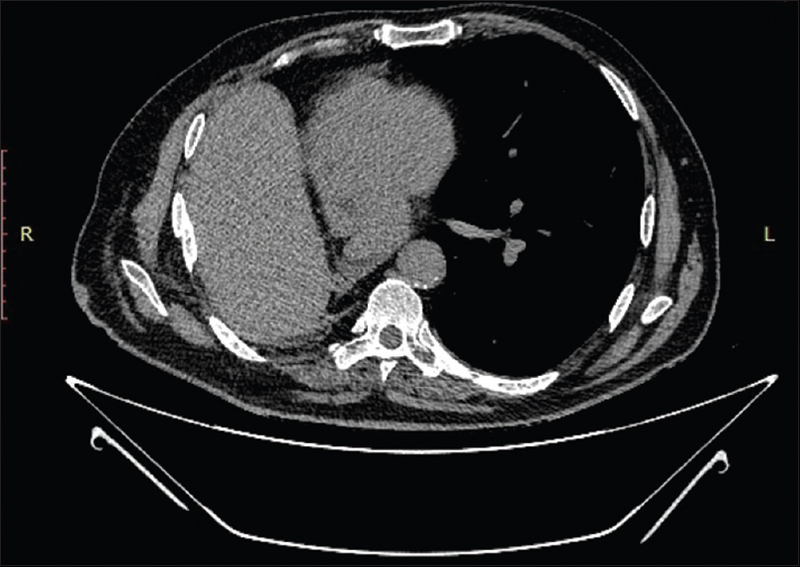 The patient was given 0.25% bupivacaine infusion through the thoracic epidural catheter. The patient was extubated 3 h after the surgery. The pain score of the patient on visual analog scale never crossed more than 4. On postoperative day 1, with regular chest physiotherapy, deep breathing exercises, and incentive spirometry, the patient showed good recovery with normal PaO2 on arterial blood gas analysis. Intermittent biphasic positive airway pressure (BiPAP) was given on postoperative day 1 and 2. Inotropes were tapered by the first postoperative day, and chest tubes and invasive monitoring lines were removed on the second postoperative day. The patient was ambulated on the second day itself. The thoracic epidural catheter was removed on the evening of the second postoperative day. The patient was discharged on 7th post-operative day. Difficulty in establishing cardiopulmonary bypass has been reported in almost all the previous patients with right pneumonectomy undergoing on-pump CABG. It may be partly due to a difficult cannulation of a fixed inferior vena cava which forms an acute angle with the right atrium. In addition, venting through pulmonary veins may not be possible. It is a well-known fact that cardiac surgery affects pulmonary function in multiple manners. Decrease in FVC, FEV1 may persist for more than 3 months after the surgery. Prolonged supine position leads to basal atelectasis. The patients, who have had a pneumonectomy done before, tolerate the changes in pulmonary functions with even more difficulty as the respiratory reserves usually decrease to half because of a single functioning lung. The patient was told to start incentive spirometry a week before surgery and nebulization with bronchodilators was started. We planned to insert a thoracic epidural catheter before induction and early extubation and mobilization was planned. Post-pneumonectomy state displaces the mediastinum; hence, to avoid any procedure-related complications, central line insertion was done using ultrasound guidance. Meticulous closure ensured minimal drains. Aggressive postoperative chest physiotherapy, incentive spirometry, nebulization, nasotracheal suctioning, and intermittent BiPAP support combined with early ambulation helped in optimal recovery of the patient. Benefits of thoracic epidural require special mention., Epidural analgesia provides superior analgesia then opioids in the post-operative period and may improve patient outcomes in terms of lung function tests. Maximum inspiratory lung volumes were 30% more in patients receiving epidural analgesia, thereby reducing the incidences of atelectasis and pulmonary infections. Fast-tracking can be achieved more effectively as the postoperative pain is less. Lower respiratory tract infection rates have shown to be reduced by up to 50%., To conclude, we can say that proper surgical planning, perioperative optimization of pulmonary function tests, and a planned anesthesia (thoracic epidural) along with fast-tracking facilitate better postoperative outcomes in post-pneumonectomy patients undergoing coronary artery bypass grafting. Smetana GW. Preoperative pulmonary evaluation. N Engl J Med 1999;340:937-44. Nonaka M, Kadokura M, Yamamoto S, Kataoka D, Iyano K, Kushihashi T, et al. Analysis of the anatomic changes in the thoracic cage after a lung resection using magnetic resonance imaging. Surg Today 2000;30:879-85. Demirtas MM, Akar H, Kaplan M, Dağsali S. Coronary artery bypass operation after pneumonectomy. Ann Thorac Surg 1995;60:232-3. Lippmann M, Au J. Coronary artery bypass surgery after previous pneumonectomy-two case reports. Scand Cardiovasc J 2000;34:541-2. Gölbaşi I, Türkay C, Sahin N, Oz N, Akbulut E, Gülmez H, et al. Coronary artery bypass grafting nine months after pneumonectomy. Tex Heart Inst J 2001;28:146-8. El-Hamamsy I, Stevens LM, Perrault LP, Carrier M. Right pneumonectomy and thoracoplasty followed by coronary artery bypass grafting and mitral valve replacement. J Thorac Cardiovasc Surg 2003;125:215-6. Kumar P, Swift SJ, Athanasiou T, Nelson JS, Glenville B. CABG 15-years after left pneumonectomy: Feasibility of off-pump approach. Cardiovasc Surg 2003;11:305-7. Shanker VR, Yadav S, Hodge AJ. Coronary artery bypass grafting with valvular heart surgery after pneumonectomy. ANZ J Surg 2005;75:88-90. Stoller JK, Blackstone E, Pettersson G, Mihaljevic T. Coronary artery bypass graft and/or valvular operations following prior pneumonectomy: Report of four new patients and review of the literature. Chest 2007;132:295-301. Zhao BQ, Chen RK, Song JP. Coronary artery bypass grafting after pneumonectomy. Tex Heart Inst J 2008;35:470-1. Ghotkar SV, Aerra V, Mediratta N. Cardiac surgery in patients with previous pneumonectomy. J Cardiothorac Surg 2008;3:11. Stamou SC, Murphy MC, Kouchoukos NT. Aortic valve replacement and coronary artery bypass via left anterior thoracotomy after previous left pneumonectomy. J Thorac Cardiovasc Surg 2010;140:719-20. Ushijima T, Kikuchi Y, Ikeda C, Takata M, Yamamoto Y, Watanabe G, et al. Totally arterial off-pump coronary artery bypass grafting after pneumonectomy. Ann Thorac Cardiovasc Surg 2011;17:320-2. Fragkidis A, Dimitriou A, Dougenis D. Coronary artery bypass grafting and/or valvular surgery in patients with previous pneumonectomy. J Cardiothorac Surg 2012;7:110. Tenling A, Joachimsson PO, Tydén H, Hedenstierna G. Thoracic epidural analgesia as an adjunct to general anaesthesia for cardiac surgery. Effects on pulmonary mechanics. Acta Anaesthesiol Scand 2000;44:1071-6. Mehta Y, Arora D. Benefits and risks of epidural analgesia in cardiac surgery. J Cardiothorac Vasc Anesth 2014;28:1057-63.